At every conference or tradeshow, you get a badge. I have a box full of them on my desk, an increasing number of them with the title of "Speaker" affixed beneath my name. I recently had a conversation with some colleagues about the importance of being a speaker at an event. 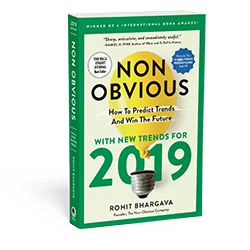 Often, the most important benefit is not just the visibility of speaking, but the license that speaker tag gives you to have a conversation with other speakers. If you think about it, the badges at a conference are like a caste system. Your badge identifies which group you belong in and can often dictate how people embrace or shy away from a conversation with you. Being a speaker is usually the best choice, because it positions you as an expert at the event and you also have a chance to demonstrate your expertise in front of a subset of attendees. Media is usually second best, because just about all the sponsors and vendors want to get media coverage. 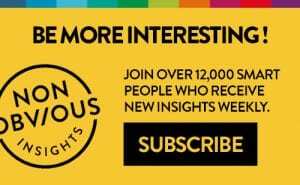 Last week at an event like the Consumer Electronics Show, however, most people would agree that media was definitely number one because of the relative importance of media coverage to that event. The interesting thing about "media" at CES (as well as at most other large events today) is that this group is usually divided into two categories: bloggers and press. 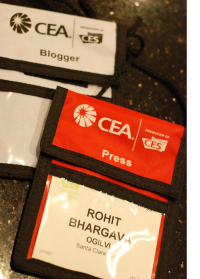 For CES, the blogger badges were gray, and the press badges were red. Thinking this would be a good chance for a bit of a social experiment, I went and got both badges … the blogger badge by virtue of my blog, and the press badge as a result of my writing being republished by the good folks at Digital Media Wire (sorry I missed the Insider event, Ned). What did I learn? Probably not surprisingly, the blogger badge got a lot less attention and special treatment. It was an odd feeling to walk through certain booths first with my gray badge and then switch to the red one. There were different rooms for bloggers versus press, and in the press room there was real food (not just snacks), rows of press releases that you could pickup and many invites for private parties or events. Clearly, there is a gap in perceived value between bloggers and journalists from the organizers of CES, as well as many of the vendors exhibiting at the event. It really is no different than a caste system where individuals are judged based on the color of their badges. The question is, when will we see this situation change? Already, there are signs that it is changing. Most notably, the fact that there is a blogger room and blogger credentials at an event of this size at all. The way I see it, in another few years, events like this will start to embrace bloggers and media on the same level and apply a similar criteria to who gets credentials. This means the real metric will be audience and reach. 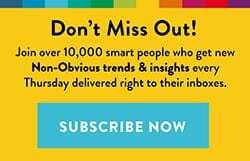 Regardless of whether you write for a blog or something else, your credentials will be based on the number of people you reach. It’s just a matter of time before it happens.